For those of you keeping tabs on the Olympics, this week is a good time to get into bobsledding, because training heats begin on Thursday. If all you know about Olympic "bobsleigh" begins and ends with a viewing of Cool Runnings, you could stand to learn a little more. First of all, you're probably wondering the difference between bobsled and bobsleigh - "sleigh" is the official term used by the Olympics, and also in the title of the Fédération Internationale de Bobsleigh et de Tobogganing. Or, the International Bobsleigh and Skeleton Federation (IBSF). But some announcers will likely say "sled" when referring to the same sport, even though it's more fun to yell, "Bob-SLAY!" The Swiss invented bobsleigh in the late 1860s by connecting two skeleton sleds and a steering mechanism. Then a firmer chassis was added after the sport became popular, because it added a degree of safety to sliding at high speeds down an icy track. They're mainly controlled by the navigator in front, who pulls on ropes connected to the runners on the inside to steer, according to Mental Floss. The other people in the sled can also steer by shifting their weight side to side, though they generally put their heads down and stay as still as possible after take-off. The person in the back is the "brakeman". They stop the whole mechanism at the end of the race so the whole team doesn't launch into the stratosphere. There are two-person teams and four-person teams. The four person teams don't have two useless people sandwiched in the middle; they're sometimes called push athletes and are extremely important for building speed. The sled itself weighs hundreds of kilograms, and it's imperative that the bob gets a really good running start. How Stuff Works reports that people trying out for bobsleigh teams are often recruited from sports where strength and sprinting ability are prioritised, such as football. According to The Denver Post, bobsleigh is scored much like luge. Each team gets a number of runs down the track across a few days, and the cumulative score wins. All the teams get four runs over two days, and when the run times are added together, medals are awarded according to time. To be very clear, you want to be the fastest, with the shortest time. Who are we watching for this year? 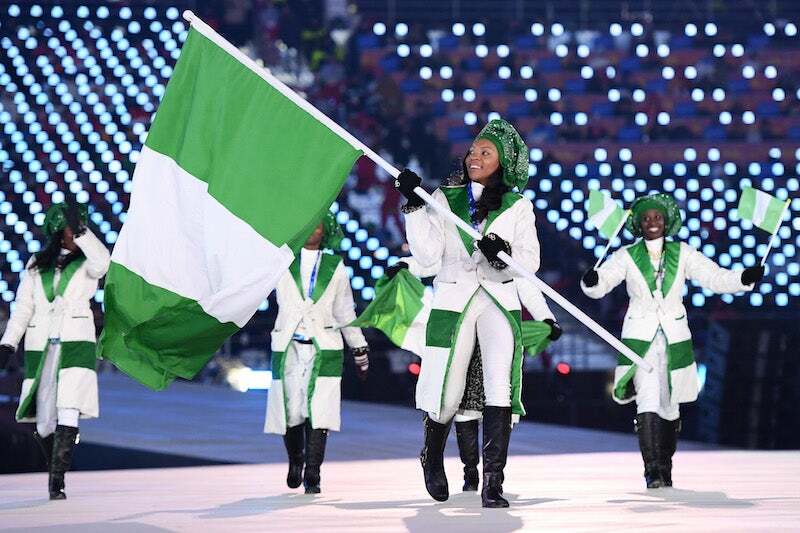 The Washington Post reports that the Nigerian women's team is not expected to place, but they're the first athletes to ever come to the Olympics from their country and the first African team to ever qualify in bobsled. So, I know who I'm rooting for: Ngozi Onwumere, Akuoma Omeoga and Seun Adigun. 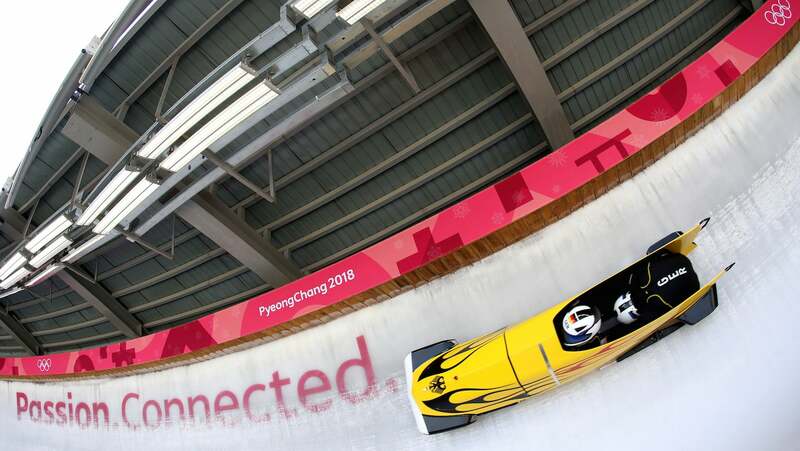 Australia's four person team of bobsledders is comprised of athletes David Mari, Lucas Mata, Lachlan Reidy and Hayden Smith. Mata and Mari will also be competing in the two man event. Four person teams are technically mixed-gender, FYI, but they are most often all men. The two man team is scheduled to compete on February 18 and 19, with the four man team following on February 24 and 25. The gold medal winner at Sochi was Russian Alexandr Zubkov, who was not allowed to compete at PyeongChang following Russia's widespread doping scandal after the games. Some bans were overturned for 2018, but Zubkov did not get a pass. You can watch any potential drama unfold beginning February 15, and keep up with the event schedule here.